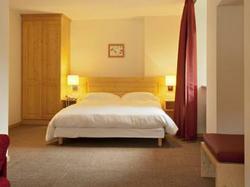 This Logis hotel is located 10 minutes south of Guebwiller, between Mulhouse and Colmar. It offers comfortable rooms with free Wi-Fi, TV and en-suite facilities. The restaurant at À L'aigle D'or serves regional specialties prepared with seasonal produce. Guests can enjoy their meal on the hotel's shaded terrace. À L'aigle D'or is situated at the foot of Grand Ballon , the highest peak in the Vosges mountains. Guests can explore this area through the mountain bike trails. Free private parking is also available. Please note that the restaurant is closed every Monday except during high season (mid July to mid September). More spacious room with a flat-screen TV and satellite channels. All rooms have flat-screen satellite TV, free Wi-Fi access and a private bathroom. This spacious suite includes a lounge area with a flat-screen TV and satellite channels.